A static desktop can sometimes be a bit boring, especially if you're a busybody who has little time to search the web for new wallpapers to apply to your desktop. DesktopSlides can help by changing your background automatically to beautiful images you define. With DesktopSlides, you're given a fresh new wallpaper each day which can be configured to rotate from a number of sources. You can set it up to do this daily, hourly or weekly. For security reasons, you should also check out the DesktopSlides download at LO4D.com which includes virus and malware tests. Additional screenshots of this application download may be available, too. 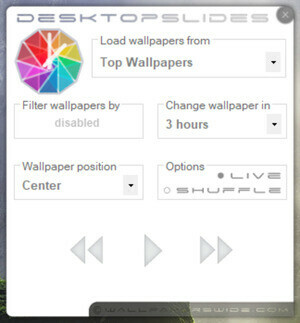 DesktopSlides download been highly rated by our users.